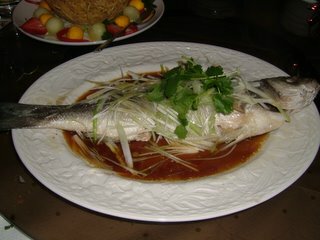 Every country has a dish it thinks is Chinese. These dishes don’t originate in China, but are often good enough to be celebrated and enjoyed. 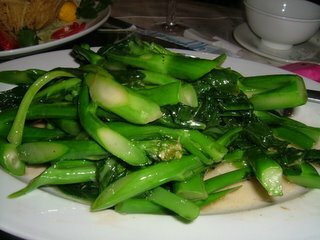 In the UK, made-up Chinese food includes crispy ‘seaweed’ (deep-fried, shredded greens served with fish floss) and the ubiquitous chop suey. 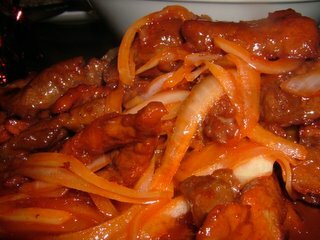 Americans can point at that peculiar sweet mustard, Crab Rangoon (no self-respecting Chinese dish contains cheese), and General Tso’s chicken. 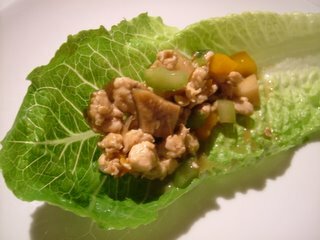 The lettuce wrap is another of these mongrel dishes, but it’s so good that you can easily forgive it its roots and embrace it. Preferably with tongue and teeth. Put the chicken in a blender, and pulse gently until it’s chopped finely. You’re aiming for a texture like mince here, not like slurry, so be careful. 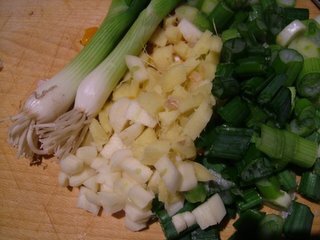 Stir-fry the ginger, garlic and spring onions together for three minutes, until their fragrance is filling the kitchen. Add the chicken and the cornflour, and stir-fry until the chicken is all white. Throw in the diced vegetables, stir-fry for another two minutes, then add the rice wine, the oyster sauce and the soya sauce with the MSG and sugar. 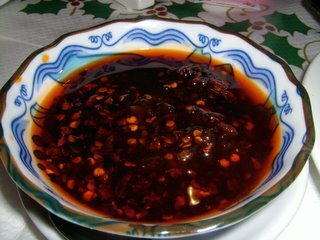 Let the liquid ingredients start to bubble, and when the cornflour has made the sauce glossy and thick, stir in the sesame oil and transfer the mixture to a warm bowl. Serve by spooning into the bowl of a lettuce leaf. I used a Cos lettuce, partly because of the charming spoon shape of a Cos leaf, but mostly because my choice was extremely limited; it’s near-impossible to buy whole lettuces these days, the whole world having gone mad for pre-mixed salads in bags. 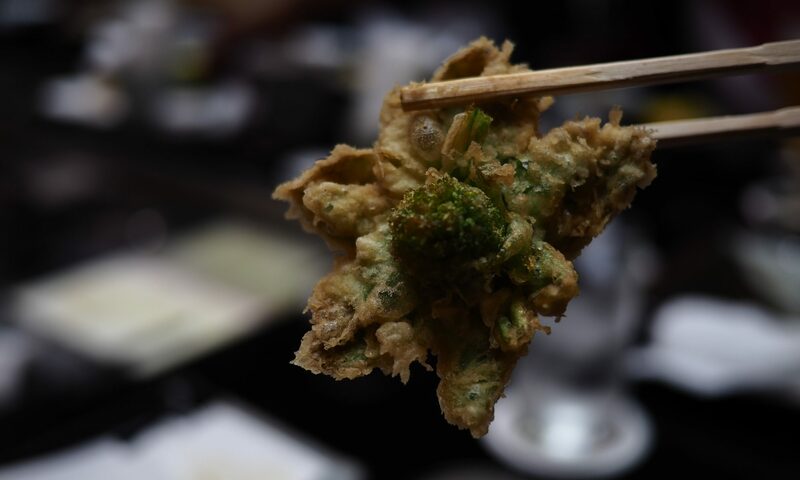 Wrap the leaf around the hot, textured filling, and then wrap your mouth around the whole thing. Christmas dinner for twelve people is a tricky one. Several of the people present admitted that they didn’t like turkey, some had moral issues around the consumption of ducks (no, I don’t get it either) and no goose this large was going to cook without being dry. 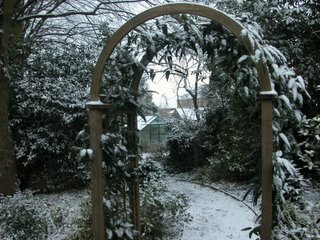 Was any bird outside the Emperor Penguin going to be big and festive enough? Would those who had been to see March of the Penguins forgive me? Were dead, French-trimmed penguins readily available in Cambridgeshire? Eventually I decided that this was unlikely, and remembered that cows come in handy, family-sized joints. I ran straight to Waitrose and ordered a whole sirloin of beef – at £60, this works out as surprisingly good value when you realise it will easily serve twelve with ample leftovers. 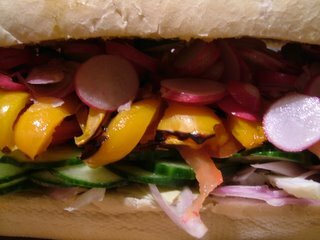 Cambridge boasts an excellent Italian delicatessen in Balzano’s at 204 Cherry Hinton Road (01223 246168). I spent a further £25 on 40 large, paper-thin slices of prosciutto, and £15 on ten small, Italian packs of porcini (cepes). I love Balzano’s. It’s a short walk from my work, and they sell every antipasto you can think of: huge jars of artichoke hearts in olive oil, enormous Kilner jars of anchovies, tubs of fresh pesto, roast vegetables and tiny capers. They also stock excellent Italian preserved goods: Barilla pastas and sauces, tins of traditional fennel sauces, nut and chocolate confections and a healthy line in fascinating little biscuits. 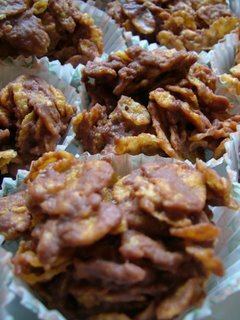 Having bought Balzano’s out of Panforte di Siena and the oddly German (but still welcome) packs of lebkuchen, I carted my treasure home, refrigerated it all until Christmas day, then drove it to my parents’ house first thing in the morning and got cooking. Mum and Dad’s house made sense in that they have twelve chairs to my six, a large table to my small one, an Aga and a conventional oven, as well as four gas hobs and two Aga ones. Mr Weasel and his family followed on later, wisely keeping out of my harried way. I rolled out two sheets of greaseproof paper large enough to wrap the sirloin in, and laid the ham in a thick, unbroken layer on top of it. I soaked the mushrooms for half an hour in hot water from the kettle, and, keeping the soaking water aside, fried them in quarter of a pat of butter with a bulb of chopped garlic until the liquid had evaporated, leaving them glossy, then added the juice of a lemon and a glass of Marsala. 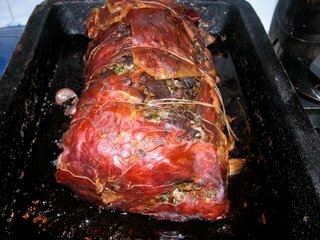 When this had bubbled away as well, I spread the nearly dry mushrooms and garlic on the ham, reserving a small handful, and covered them with a thick layer of of chopped tarragon, parsley and sage. 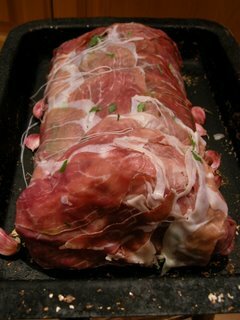 I placed the raw sirloin on top of the layered prosciutto, mushrooms and herbs, and used the greaseproof paper to wrap it in them, Swiss-roll style, folding ham over the ends and tying the whole bundle tightly. I put it in a large roasting dish, with another bulb of whole, unpeeled cloves of garlic tucked in around it. These photographs, incidentally, are the reason you’re reading this a week and a half after Christmas. I remembered all the meat but forgot my camera, and had to use my Dad’s. The bits of handshaking which meant the pictures from his camera would end up on my computer ended up rather more complicated than they needed to be . . . still, they’re here now, so read on. A beef sirloin will cook amazingly fast, even one of this size. Mine needed an hour and a half in the top (roasting) oven of the Aga, which runs at around 190c. The best way to tell how yours is doing is to use a meat thermometer, stabbed into the middle of the joint before you start to cook. Keep an eye on the thermometer from 45 minutes into the cooking time. When the needle reaches ‘rare’, take the joint out and rest it on a serving dish for ten minutes. I deglazed the juices and sticky deposits in the pan to make an intense, rich gravy with the mushroom stock, the reserved mushrooms, half a pint of Marigold vegetable stock, another two glasses of Marsala and half a pint of crème fraîche, all simmered until reduced and silky. 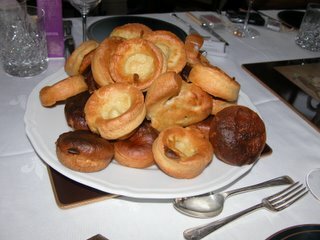 I served the beef with King Edward potatoes roasted in goose fat, Brussels sprouts (steamed and served with roast chestnuts), petits pois a l’étoufée (peas cooked in a light vegetable stock with lettuce, butter and spring onions) and Yorkshire puddings, cooked in muffin tins. After a starter of gravadlax, with a homemade dill sauce and foie gras with quince jelly, we launched upon the main course. 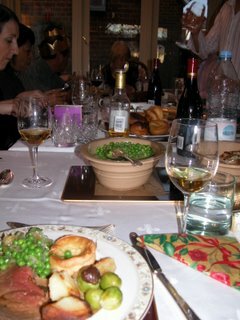 And a happy silence fell on the chattering table, which is the best Christmas compliment I could have had. I’m already looking forward to next year, when perhaps I will get my hands on that penguin. 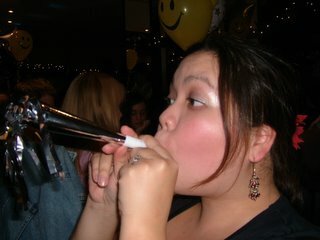 It’s New Year, which merits a rare photo of me doing something . . . candid. Here I am pootling the New Year in on a celebratory pootler. John and Cora Lau are old friends of ours who run the Man Ho Chinese restaurant in Luton (72 Dunstable Road, LU1 1EH, 01582 723366). The restaurant has been there for twenty-odd years now (a lot like me), and serves up excellent, traditional Szechuan food in a real degree of style. The chef is from Hong Kong, the ingredients are fresh from Billingsgate Market and the Far East – all of this sandwiched in amongst Luton’s endlessly peculiar mix of evangelical churches in old bingo halls, mosques, casinos and kebab shops. New Year and all our other celebrations seem to happen at the Man Ho; driving forty miles for dinner is nothing when dinner is this good. One of the very best things about being Chinese is that we get two New Years, Western and Chinese; the Chinese one will probably be spent at the Man Ho too. 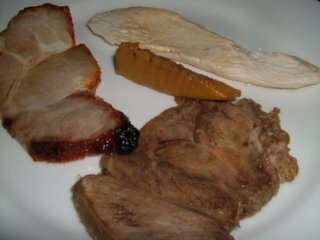 We opened with cold meats; slices of velvety poached chicken, Char Siu (Chinese barbecued pork) and a roast beef, all with a light, soy-based sauce. 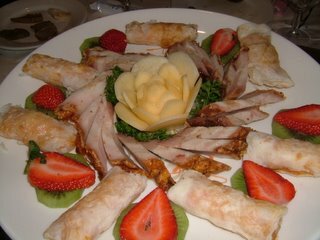 John was trying out a new dish alongside the cold cuts, which you can see in the picture, in the centre of the plate. 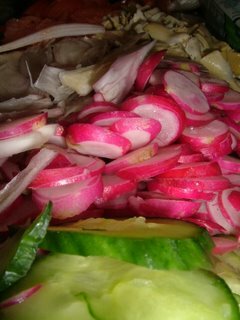 It’s a slice of fresh bamboo shoot, braised gently with soy and five spices, and it was a perfect, tender accompaniment. John is hoping to put these bamboo shoots on the menu in the New Year. John knows me well, and had pre-positioned a bowl of his home-made chili oil (which he always seems to manage to avoid giving me the recipe for with utmost politeness, the clever man) next to my place setting. God knows how he makes it, but it’s downright perfect and I wish he’d bottle it. 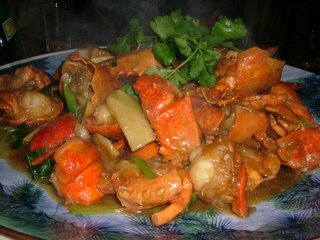 I can’t comment on the next course, lobster in ginger and spring onion sauce, because I am, to my eternal misery, terribly allergic to lobsters. I’ve wound up unable to breathe, covered with hives and having adrenaline shots in my backside twice in the last ten years as a result of careless lobster-ingestion, so I sat this course out and just smelled it. It smelled fantastic. Aren’t you glad Mr Weasel doesn’t write this blog? 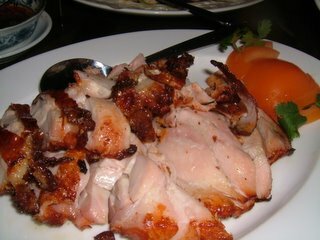 Next came a crispy duck with pancakes, which is a dish you’ll all recognise. Here is mine, unwrapped. Something bizarre, secret and good goes on with the sauce in these pancakes, and I suspect that John (who remains taciturn on the subject) makes it in the restaurant. 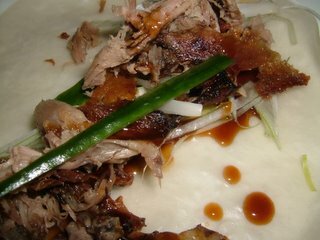 Crispy duck pancakes are my god-daughter’s favourite food. They’re my brother’s favourite food. They’re my husband’s favourite food. They’re one of mine. I have some theories about this, which have to do with interactive eating and the wonderfulness of things wrapped in other things . 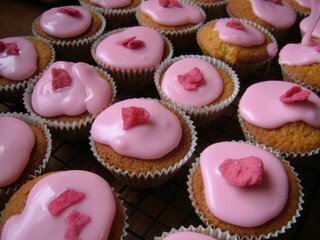 . . but I suspect it may actually be to do with the fact that they’re just very, very tasty. Five dishes arrived at once, as a final course, served with plain rice. Butterflied prawns in a basket with chilis and garlic; a whole sea bass, steamed in soya sauce and spring onions; sizzling fillet steak; a crisp roast chicken; and some choi sum in oyster sauce. All were excellent. Best I show you these as a list of photos, or we’ll be here all day . . . 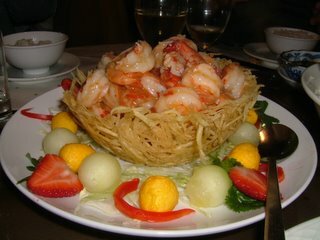 The yellow spheres around the prawns are hard-boiled quails’ eggs, deep-fried and used as an extremely delicious garnish. 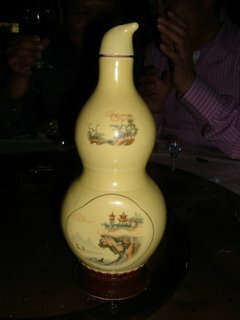 John helped us see the New Year in with a gourd-shaped, porcelain bottle of Sanpien Jiu, a very special tonic wine made from steeping rare herbs in a Chinese rice liqueur. On top of all the champagne and pootling, it left me with a mammoth headache on New Year’s Day – a headache which was worth it a million times over for this extraordinary meal. Thanks very much, John and Cora – we’ll be back soon.